Hello friends! Happy almost summer! Who has vacations planned? Who loves working in their yard? Who is a sun worshiper? I admittedly don't LOVE summer. I love Spring, but heat, sweat, and sunburns, nah, not so fun for me! No worries my house will feel like winter because that is how we like it and everyone who comes over will need a blanket or sweatshirt! Makes me giggle. If you watch my YouTube videos, you know that I am wearing my glasses for right now so I am not doing as much recipe writing and testing as usual. I am waiting for a rescheduled appt, to get my new contacts, they are special orders and take almost 3 weeks to arrive. UGH. SO, my husband came bee-bopping in from work last weekend and wanted to make mini chicken pot pies. I suggested we film it and it ended being an all day venture that was so worth it, but my husband....is a ham when I turn that camera on! As far as the videos, they will be split into three parts. So many of you have commented through the years that you have such a hard time with pie crust. I will show you how easy mine is and how perfect and flaky it is! No secrets, you don't have to make it will standing on your hands. The planets don't have to be in perfect alignment either. You will see! So let's get started on this filling of my hubby's. 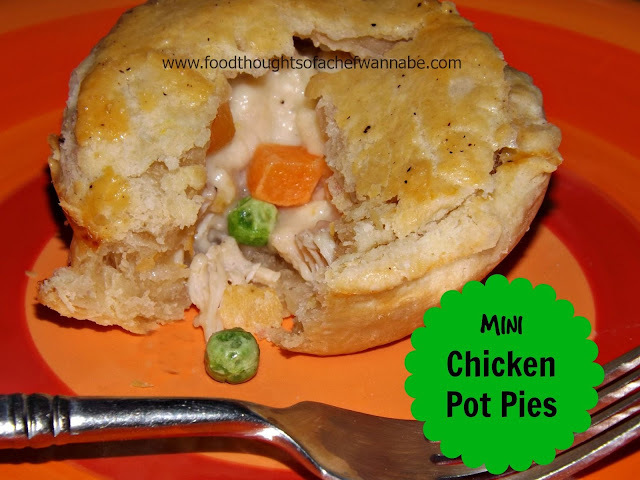 If you love the Marie Callender Pot Pies, these are going to be your jam,only BETTER! This will make about 12 mini pies. You can double the pie crust or do what we did. Divide the remaining filling into 2 freezer bags. One of them we turned into a cheesy sauce, added egg noodles, and butter bread crumbs on top and that was a dinner for 2 nights with a salad. The last bag, we thinned down, added extra veggies and made a fantastic creamy chicken and veggie soup! In a large skillet, melt butter and add in chicken. Season to taste and cook until fully done. Drain chicken, and set aside for later. Optional: 1 large potato cut into a small dice. Onion finely minced, Celery, Green Beans. My husband has a grudge against veggies so we just used frozen peas and carrots! Melt the butter in your pot, add in flour and cook for one minute while stirring. Add in your milk, start with 6 cups, it may be all you need, you want a thick consistency. After about 5 minutes, add in your chicken bouillon cubes. Stir until they are dissolved. Add in chicken, and veggies and stir. Refrigerate for at least 1 hour before making the pot pies. You want this to chill and become fairly firm, it helps the small pies not overflow, and give it a fabulous hearty texture. Using cookie cutters or the top of a glass, find 2 that are just a bit different in shape. The smaller for the bottom of your muffin tin, and the larger for the top! Spray your muffin tin with nonstick spray or brush with butter and get all of them lined with pie dough. Using a cookie scoop, fill each one and then place a top on. Try to get the top to stick to the top of the bottom crust to seal it! Use an egg wash (1 egg+splash of water) to brush the tops. Bake at 350, for 30-35 minutes or until golden brown!